This sambar comes handy when u r short of sambar powder and i often make this type since we r hooked to the taste of this delectable sambar. I know everyone knows abt this but wanted to register for my readers who r beginners / bachelors ..
Tomato --chopped -- 1 no. Boil the thuvar dhal with garlic ,hing , turmeric powder and zucchini for 3 whistles. Soak the tamarind and squeeze the juice . Mix the red chilli powder,coriander powder and salt in the tamarind juice.. Take a kadai and pour the oil. Do the seasoning with mustard seeds,fenugreek seeds,cumin seeds and finally add the chopped onion and curry leaves ,fry for a minute in very low flame. Now pour the tamarind juice mixture and give it a boil. Add the boiled thuvar dhal mixture and allow to boil. U may add the coconut paste at this stage if u wish.. and again cook it for few minutes..and switch off. I purposely din't add coconut paste to suit my family's diet .. U may add the coconut paste if u wish..
that is a nice twist--can't wait to try !! Hearty and delicious. MY 1st visit here. You have a nice space.Do drop by simply.food some time. 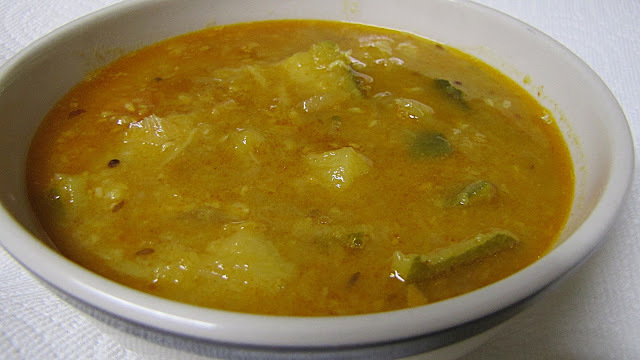 amazing recipe of the Sambhar, looks delicious.